Learn to work with the built-in String object. Learn to work with the built-in Math object. Learn to work with the built-in Date object. length Read-only value containing the number of characters in the string. 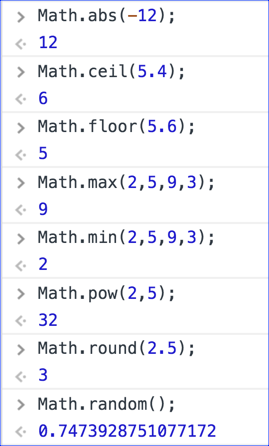 Spend some time going through methods in the table below and trying them out in the Chrome DevTools Console. Note that most programming languages have similar string methods, though they may use different names. Some of the string methods will seem obscure ("When would I use that?"). Don't worry too much about that. The most important takeaway is to understand that there are a lot of built-in methods for working with strings and to get some practice using them. charAt(position) Returns the character at the specified position. indexOf(substr,startPos) Searches from startPos (or the beginning of the string, if startPos is not supplied) for substr. Returns the first position at which substr is found or -1 if substr is not found. lastIndexOf(substr,endPos) Searches from endPos (or the end of the string, if endPos is not supplied) for substr. Returns the last position at which substr is found or -1 is substr is not found. substring(startPos,endPos) Returns the substring beginning at startPos and ending with the character before endPos. endPos is optional. If it is excluded, the substring continues to the end of the string. slice(startPos,posFromEnd) posFromEnd is a negative integer. Returns the substring beginning at startPos and ending posFromEnd characters from the end of the string. split(delimiter) Returns an array by splitting a string on the specified delimiter. toLowerCase() Returns the string in all lowercase letters. toUpperCase() Returns the string in all uppercase letters. trim() Removes leading and trailing whitespace. Math.SQRT2 Square root of 2. Spend some time going through methods in the table below and trying them out in the Chrome DevTools Console. Math.abs(number) Absolute value of number. Math.max(numbers) Highest Number in numbers. Math.min(numbers) Lowest Number in numbers. Math.pow(number, power) number to the power of power. Math.random() Random number between 0 and 1. Dates are created using the Date() constructor (a special function for creating objects). To create a Date object containing the current date and time, the Date() constructor takes no arguments. When passing the date as a string to the Date() constructor, the time portion is optional. If it is not included, it defaults to 00:00:00. Also, other date formats are acceptable (e.g., "3/2/2017" and "03-02-2017"). When passing date parts to the Date() constructor, dd, hh, mm, ss, and ms are all optional. The default for dd is 1; the other parameters default to 0. Months are numbered from 0 (January) to 11 (December). In the example above, 6 represents July. Some common date methods are shown below. In all the examples, the variable now contains the date "Wed Aug 08 2018 13:34:50 GMT-0400 (Eastern Daylight Time)". getDate() Returns the day of the month (1-31). getDay() Returns the day of the week as a number (0-6, 0=Sunday, 6=Saturday). getMonth() Returns the month as a number (0-11, 0=January, 11=December). getFullYear() Returns the four-digit year. getHours() Returns the hour (0-23). getMinutes() Returns the minute (0-59). getSeconds() Returns the second (0-59). getMilliseconds() Returns the millisecond (0-999). getTime() Returns the number of milliseconds since midnight January 1, 1970.
getTimezoneOffset() Returns the time difference in minutes between the user's computer and GMT. toLocaleDateString() Returns the date portion of a Date object as a string. toLocaleString() Returns the Date object as a string. toLocaleTimeString() Returns the Date object as a string. toGMTString() Returns the Date object as a string in GMT timezone. //Returns "Wed, 08 Aug 2018 17:34:50 GMT"
Let's see how we can use dates to build useful helper functions. Run this page in your browser and then click on the buttons to see how they work. In this exercise, you will create a function that returns the day of the week as a string. Write a dayAsString() function that returns the day of the week as a string, with "1" returning "Sunday", "2" returning "Monday", etc. Write an enterDay() function that prompts the user for the day of the week (as a number) and then alerts the string value of that day by calling the dayAsString() function. Write a getCurrentDay() function that alerts today's actual day of the week according to the user's machine. Add a "CHOOSE DAY" button that calls the enterDay() function. Add a "GET CURRENT DAY" button that calls the getCurrentDay() function.